For many years, the bulletin in my church would provide name and title for several people involved in worship services. Calling out the organist and lay reader, for example, is just as important as identifying the choir director and pastor. That list also had an entry for minister as "every member of the congregation." At least from a Protestant Christian perspective, all of us are ministers. The term is not a synonym for someone who pastors a local church. I mention this to provide some context for a statement that I feel compelled to make. It might be obvious. Then again, maybe not. Among other things, Inappropriate Conversations is, for me, a ministry. Am I "preaching" the notion that strict separation of politics, religion, and aspects of popular culture (including sexuality) has not served us well? Perhaps. If so, this post is not a signal that things are changing in any way. On the contrary, I anticipate the tone and approach remaining the same. It may be enough to say, for now, that I am reaching out in several directions, intentionally. * I'm asking Christians to view Jesus as something more than a celebrity they follow with an "I like this" or even an "I'm like this" mentality. * I'm correcting or even rebuking those who seem to worship their Bible, whether they realize it or not, without actually having a full understanding of what it says. * I'm also reaching out to people who have left the church or bypassed it completely because they have been either marginalized or harmed by what I call "politically active Christianity" but is more commonly known by terms like "the religious right." * Finally, I'm delighted to know that I'm also speaking (literally, from a podcast perspective) with like-minded Christians. Almost without exception, these are followers of Christ who have felt the Holy Spirit move them, either in a completely different direction or simply out of complacency. That last group describes me as well. Examples are sprinkled throughout these podcasts -- sporadically, by design, to avoid becoming preachy. Make no mistake, though, ministry can and does happen in a variety of ways. It doesn't require a worship service, and certainly not a sermon. Is there some risk in speaking up, in exercising my freedoms of religion and speech in this manner? There shouldn't be, politically, for reasons that go back to the founding of this country. I believe there is greater risk in silence. Why, and what does that have to do with ministry or God? "It's far better to say something that should not be said, than not to say something that should be said." I attribute those words to the Holy Spirit at 1:37 a.m. CST on February 7, 1987. How would you remain willfully silent after hearing that? I haven't and I won't. Here is a view that I have heard before, and it was presented to me again this week: "You say that you want tolerance and despise, hate, but if I don't agree with everything you say, you call it intolerance and hate. Explain to me again just how that works." Now, it is quite possible that this conservative friend was trying to discuss a contentious issue with someone who isn't very open-minded about their "progressive" ideas. That happens. On the other hand, it seems more likely that the discussion wasn't really about issues at all. What if the focus was really on identity instead? At the very least, I can imagine my friend referring to a person as a sinner, making a lifestyle choice, or asking for "special rights." Sad to say, that happens as well. I have a response that asks Christians to consider when it may be important to tell someone that disagreeing with them is, inherently, inappropriate. It is usually intolerance when people tell me that I cannot possibly be a Christian because Jesus isn't real and therefore I couldn't actually have a relationship with him as my Lord. We can argue that it is hypocritical to call someone intolerant for forcing us to believe everything they say; but, like it or not, a larger group than just Christians would and should label someone like that as "intolerant" and perhaps hateful if they layer in a bit of verbal abuse, too. They don't have to agree with me about everything I think or believe. However, when it comes to questions of who I am, whom I love, and how that most important of relationships works in my life, that isn't a matter of opinion or an issue for public referendum or debate. Anyone who treats me harshly or dismissively on that basis deserves to be taken to task for it. Most of the time when questions like this are raised about tolerance, I find that the issue isn't about questions of opinions where disagreements can easily be managed with gentleness and respect (1 Peter 3:15-16). It tends to be about judgments that cut to the very core of who a person is. If we don't respect persons' understandings of who they are (Christian, in this example), then we rightfully should be accused of failing to love in the same measure that we fail to listen. Here is the problem: I wasn't really talking about Christianity. It is true that I have been dismissed, on occasion, for being a Christian. Both courts and society would quickly leap to my defense, though, if that became a basis for denying me a job, or access to medical treatment, or the right to -- for example -- get married. Religion isn't the only thing that cuts to the core of who a person is. So, no, we aren't entitled to agree or disagree with someone's sexuality, whether it be a matter of identity or preference. You don't get to "disagree" with whether someone is gay or straight. It's just that simple. 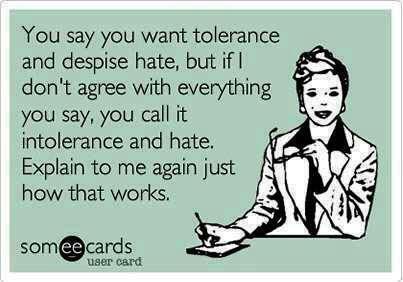 Hopefully, I've fully explained just how this question of tolerance works. 118: Where Would I Be Without God? Personally, the better answer to a question like "where would I be without God" calls up a lot of powerful memories. I know the Holy Spirit has moved in my life through specific people and situations, which I can recall as vividly as if the intervening decades disappeared. I can name the names, in fact, and I do a couple of times. They are people who loved me in a way that supersedes human understanding, empowering me to do God's will. I have loved. I do love. I will love. Some discussions online and among friends have included questions of whether Contemporary Christian music is actually either good music or good Christianity. I have been both a critic and an apologist for CTC music, going all the way back to when I managed the allocation and replenishment of those artists in the 1990s. I see it both ways, I suppose. One artist that answers both questions with an emphatic Yes is Chris Rice. I have backed that opinion by purchasing every one of his albums and seeing him in concert twice. Given the opportunity, I'd see a show again tonight. I'll have more to say about Chris Rice in an upcoming Different Drummer segment, no doubt. A few years ago, a question was posed to me online: where would you be without God? There are two answers, actually. One is personal, which I'll cover next week. The other is philosophical, a combination of ontological and cosmological arguments going back a thousand years. "God's existence is necessary for my existence" is, in some ways, a faith-based equivalent for "I think; therefore, I am." A very old and original Christian answer to this question is that without God, there would be no "me" to ask the question, much less attempt an answer.